We offer the opportunity to individuals to come aside for a day to reflect in quiet and stillness. Led quiet days 2018 usually take place monthly, from March, on Saturdays. A Religious Sister from our Congregation will lead reflections and offer advice that will lead the participants into prayer. On a personal quiet day, the participants will direct their own time and prayer as they are comfortable making use of the Chapel, Prayer Room and grounds. Another room may be occasionally free but cannot be guaranteed. Spiritual Direction may be available but must be booked in advance. Whichever type of quiet day you chose to join, refreshments of tea, coffee and biscuits are provided, while participants can bring a packed lunch. There is also the opportunity to order lunch which will be charge at the advertised rate. As Kairos is a busy Retreat centre, quiet days must be booked in advance; this is to ensure we can provide you with a space that will be conducive to your needs. To book quiet days please phone or email to confirm availability and to complete a booking form. The suggested donation for quiet days is £10 per person. However, we would not wish anyone to feel they cannot come, and we would welcome donations of any amount. Do nothing at all…sit or kneel or lie down…and wait for God to lead, to speak, to put ideas and thoughts and prayers into the mind. Relax and rest. If literally doing nothing at all is impossible, do something creative with the hands. Use something to ‘spark off prayer’…the Bible, the hymn-book, phrases or short prayers…use something quite short and dwell on it. Read books about prayer or a book of prayers, being prepared to stop reading in order to pray. Walk about in the garden, thinking, taking no notice of anyone else, being aware of God. 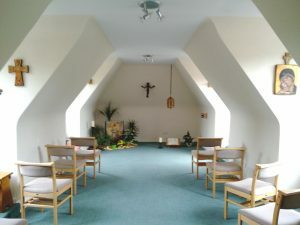 Stay in the chapel and use the time for your own usual prayers, with the added help that there is more time than usual. Use the time to pray for others…perhaps a few, or only one (not a long list). Bring them to God to share his presence with you in the quietness. Face up to yourself and your particular needs, knowing that God will deal with these if you give him time and room. Do not dwell only on the need but on the receiving of help. A very practical and active use of the time could be to think out deliberately your own present method and practice of prayer (private and public worship habits). Plan afresh if necessary…write down ideas to try out. If the present pattern is unsatisfactory, now is your chance to do something about it. Remember, if you make an ideal plan you will not necessarily be able to keep to it perfectly, but it is worth a try. If all else fails, do not feel guilty if you do something that does not seem an ideal use of time. If none of these suggestions appeals to you, and you don’t find a better way of spending the time, talk to someone about it and decide why it has been unprofitable.